Today is my last day of work! By 4:30 today, I'll be officially on maternity leave. I'm not sure whether I can't wait or if I'll miss it. Hopefully, I'll get some things done and have a bit more time for scrapbooking, swimming, dog walking, and relaxing before the baby arrives. We had the weekend off, so we got a jump on the relaxation. Quite nice. No need to go anywhere, do anything, or have any schedule. Hmmmm... the last days of quiet. We'll enjoy them. 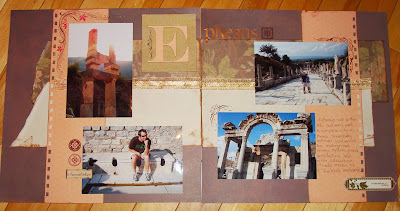 This layout is from Ephesus, in Turkey. I wanted to highlight a few things, in case you're looking for new ideas or techniques to try. These are actually nothing new, but maybe something you haven't thought of in awhile or something that may work for a project you're working on. First off, make sure you hang on to the negative portion of any chipboard elements you have. Don't just pop out the 'e' and toss the rest. I always run out of e's so I end up using the 'leftover' bits a lot. 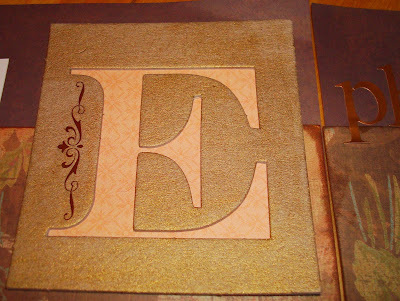 For this title, I was short an 'e' in my alphabet stickers, so I went into my stash and found this big guy... It actually became a focal point and adds a lot to the layout, I think. Also, keep in mind that dressing up chipboard is easy with a simple rub-on and some acryllic paint. I also added a bit of paper behind so that the e was all one colour. Chipboard is pretty versatile, keep it in mind for your next project. Tearing and rolling edges adds dimension and helps age papers, and works well along with distress inks. 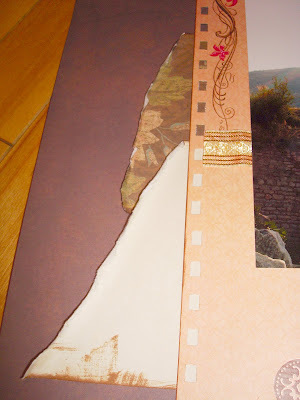 I also used my bind-it-all as a punch to make the notebook like border on the peach paper. Hopefully, my scrappy mojo doesn't dissapear now that I have some free time... Wish me luck! Danyl Johnson is freaking amazing!!! I'd buy his CD.